Located just a few miles north of Jacksonville, Amelia Island is part of the Sea Islands chain of barrier islands, on Florida’s Atlantic coast. It has long been an idyllic place to enjoy a more relaxed pace of life. It is also the perfect backdrop for Southern Living’s 2019 Idea Home. Southern Living is a publication that reaches more than 23 million people each month. 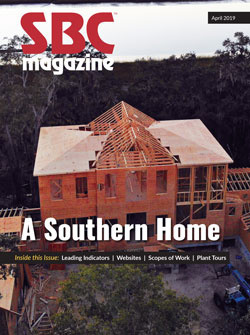 It focuses on celebrating the “essence of life in the South, covering the best in Southern food, homes, gardens, and travel.” Since the early 1980s, they have sponsored the construction of a custom home each year that exemplifies Southern culture. They then highlight that home in their publication throughout the year. Understandably, competition is fierce between homebuilders to win the right to construct this high-profile project each year. Just like a country vying to host the Olympics or the World Cup, each builder brings a unique offer to the table with regard to location and their architectural concepts for the house. The proposal by Riverside Homes, a locally owned homebuilder based in Jacksonville, was deemed the best for 2019. Riverside Homes was recently voted “Best of St. Augustine,” and has won “Best of Houzz” three years running. While those accolades certainly put the Southern Living selection committee at ease with regard to the quality of the house Riverside would build, the home’s location within the Crane Island development on Amelia Island is most likely what put them over the top. Riverside is one of only four builders with exclusive rights to Crane Island, a luxury 113-home master planned community. This 185-acre site is the last development site with waterfront property on the island, with over 3,500 feet of Intracoastal Waterway frontage and over 4,000 feet abutting salt marshes. Set amongst over 100 acres of mature maritime forest, one of the community’s unique covenants is 20-25 percent of each home’s façade must be dedicated to porch space. Riverside’s ambitious proposal was to build a 6,790 square foot home using some of the best concepts they had developed over the years as a homebuilder. “This really is a dream home,” says Chris Wood, co-owner of Riverside Homes, “Our team understands how important it is to capture the authenticity of this style of home. We have worked very hard and very closely with the architect to ensure we are giving Southern Living enthusiasts exactly what they expect.” Upon completion, Southern Living anticipates nearly 20,000 visitors to travel from all over the world to tour the home. Due to a long selection process, one challenge Riverside faced was the need for a very agressive construction schedule. The selection was announced in September but Southern Living needed the home completed by May 2019 in order to begin featuring the house in its summer issue. To appreciate the task Apex accomplished, it’s important to consider both the engineering and design work (at right), as well as how all their work up front contributed to a successful component design and installation process on the jobsite (page 26). It turns out a tight, four-week turnaround wasn’t the most challenging aspect of the Southern Living 2019 Idea Home project. Poor soil conditions, local ordinance limitations and multiple revisions to the home up to the time of final permit all posed unique obstacles Jeff and his team at Apex had to overcome. Fortunately, they were brought in on the front end of the project, so they were involved in every step from conceptual to final construction documents. “It was a lot like the design-build projects we do,” says Mike. Fortunately, the builder approached them as a partner. “We got an initial set of rough drawings and the concept for the roof,” says Jeff. Apex then acted as the engineer of record (EOR) for the project, determining the flow of loads from the peak of the roof down through the foundation. The architects wanted to wrap the foundation piers with a brick veneer for aesthetic purposes. “That meant we needed to design the floor trusses to hang over the foundation by four inches,” says Jeff. Normally, that wouldn’t be a big deal, but the cantilevered floor trusses then created a height issue for the structure. According to Jeff, in Northeast Florida the typical house is slab on grade with wall framing starting eight inches above grade, has a nine-foot first floor, a sixteen-inch floor system, an eight-foot second floor and around a ten-foot roof height. On Amelia Island, a local restriction limits the absolute roof peak height at 35 feet above grade. That would be easy to comply with if this was a typical house. However, this is anything but a typical house. With the 2019 Southern Living Idea House, the architects wanted to recreate the southern plantation style. They wanted everything to impress the eye and give anyone walking up to the house a sense of grandeur. “As a consequence, the wall heights for both floors are eleven feet and the floor depths were specified at 20 inches to accommodate all the MEP,” says Jeff. “There’s also a steep roof pitch over the center of the house.” So when he added in the height of the beam under the cantilevered floor trusses, Jeff suddenly had a math problem. In designing the masonry pier foundation (see Illustration 2), Jeff had to collaborate with the building department, a civil engineer, the architects, and the builder to negotiate the grade on the lot. Local ordinances limited the amount of lot infill to three feet. With the lowest horizontal being set at nine feet, Jeff needed the maximum infill to raise the existing grade up. Of course, raising the grade made the math even more difficult. In addition to site planning, the developer worked with the building department to overcome the local building height restrictions. Fortunately, they understood the challenge and were willing to collaborate to find a solution. “Ultimately, the county allowed us to use the mean roof height, instead of the maximum height,” says Jeff. In essence, the mean roof height is half the distance between the peak of the roof to the eave, which gave Jeff several additional feet to work with. Another significant value Apex brought to the table was their responsiveness. “We were making constant changes throughout the entire process, both parties worked to accommodate the other,” says Jeff. “There were four major changes to the design between the initial permit on October 11 and when we submitted for final permit on December 5.” Those changes ranged from small things like moving a stairway to bigger changes that affected the foundation. Jeff was in constant contact with the builder and design firm throughout the process, “we knew on a high-profile job like this we needed to be as accommodating as possible.” Fortunately, Apex was compensated for all the additional changes. For the trussed portions of the roof, Jeff was attuned to the needs of the truss designer and prepared both the roof truss and floor truss layouts. “I wanted to make sure the designer had a full understanding of the intent in each roof and floor section,” says Jeff. The short construction cycle time of the 2019 Southern Living Design House was made possible by using roof and floor trusses. “Having the ability to collaborate directly with the truss designers at True House and being able to talk through changes as they occurred made all the difference in the world on this project,” adds Jeff. That collaboration also ensured a smooth installation. “I won’t lie, I had a few sleepless nights as they were installing the first floor,” says Jeff. “If the floor system didn’t line up perfectly with the pier foundation, I knew I’d get a call.” When his phone didn’t ring and they started working on the second floor, he knew they had done a great job coordinating with True House. Thanks in part to the collaboration between Apex and True House, the project is currently on pace to finish ahead of schedule. Exactly what the homebuilder hoped for when they originally approached Apex to partner with them on this project. Thanks to the collaboration between Apex and True House, the 2019 Southern Living Idea House is currently on pace to finish ahead of schedule. The success of this high-profile project means a great deal to Riverside Homes, a valued customer.